Having received critical praise and prestigious Olivier and Tony Award nominations for his previous work in Shakespeare productions, Jude Law has once again returned to tread the boards as a Shakespearean King. Henry V is the last of five productions in the Michael Grandage season at the Noel Coward Theatre, following sell out success with Privates on Parade, The Cripple of Inishmaan and A Midsummer Night’s Dream. Henry V is the fourth and final part of Shakespeare’s tetralogy of historical plays, following Richard II and Henry IV part 1 and 2. The play follows the reign of King Henry V, specifically the assassination plot against him, the battle of Agincourt, his notorious St Crispin’s Day Speech and of course his attempts to woo French beauty, Princess Katharine. 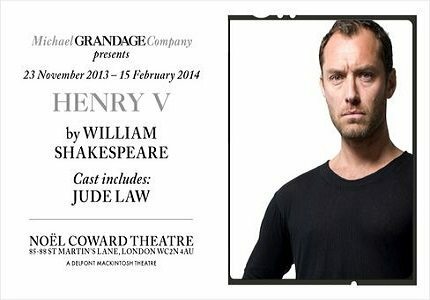 Hollywood, TV and stage star Jude Law takes on the role of Henry V and Jessie Buckley plays Princess Katharine. Michael Hadley, Norman Bowman, Pradanna Puwanarajah and Ashley Zhangazha also feature in the show. The creative team includes Michael Grandage as director, Christopher Oram as Set and Costume Designer and Adam Cork as Composer and Sound Designer. The production features several moments of violence, including one bloody battle, so is not suitable for young children. Older children who are accompanied by an adult may enjoy the show for its educational qualities.